The Lions Cavalcade came into existence in 1987 when it was felt that as Lions we needed to establish a highly visible province wide fund raising program to raise funds to help support Diabetes Canada with one of their programs to raise funds for Diabetes Awareness throughout Alberta and NWT. Thus the T.D.R.P (Traveling Diabetes Resource Program) which was being operated by Diabetes Canada(Alberta/NWT) at that time was adopted by the Lions Cavalcade for Diabetes committee. 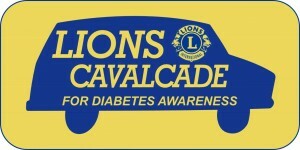 Each year a Lions Club in Alberta hosts a Lions Cavalcade Parade and campout in their community in late May or early June at which time any club in attendance can present their donations to Lions Cavalcade for Diabetes Awareness committee who in turn pass these donations on to Canadian Diabetes Association to support the TDRP. The Lions Cavalcade for Diabetes Awareness committee has raised in excess of $600,000.00+ from Lions Clubs and Private donations to support the Travelling Diabetes Resource Program and the Vans operated by Diabetes Canada (Alberta/NWT), which are used to promote this program throughout the Province and NWT since its inception. Each year a Lions Club in Alberta hosts a Cavalcade Parade and campout in their community on the first weekend of June at which time any club in attendance can present their donations to Lions Cavalcade at the “Parade of Green”. This parade takes place through the streets of the Host clubs community and is made up of decorated vehicles from all the Clubs present. After the parade a BBQ is held with a session of fellowship where those present can win prizes donated by local merchants or purchase gifts In a silent auction. Each year a request is sent to all Lions Clubs in Alberta asking for a club to apply to host the Cavalcade Parade and camp out indicating what year they would like to host this event. We are looking for a Lions Club that would be interested in hosting the annual event, contact MDC Chairperson at pdg37e@sunraybase.ca for further information. The Cavalcade committee attends all District and MD Conventions held in Alberta with our full display and sales table. At each of these events we provide an opportunity for all Lions in attendance to purchase items that we sell to raise funds to support the TDRP Van operated by Diabetes Canada. We also provide information for all in attendance to take away with them back to their respective clubs.